“I’m the only one in my family that tangles with cars!” laughs Dale O’Dwyer as we ask when he was first bitten by the racing bug. “Straight out of school I had mates messing around with street cars… I tried my hand building a show car then started racing that, and I got hooked on going faster,” he elaborates. Fast forward twenty years, and O’Dwyer is still racing the very same car he started competing with some twenty years ago. “I’ve been racing Super Gas for eighteen years. It took me around two years to build it; it’s the only pure drag car I’ve ever owned,” continues O’Dwyer of the history and incredible bond he shares with his HZ Holden. Powered by a very simple 383-cube power plant and backed by a Precise Automatics gearbox, the combo’ certainly isn’t the biggest and baddest in the class however the key to the car’s continued success may very well be in its simplicity. 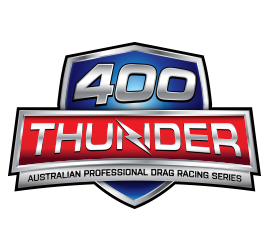 Incredibly, O’Dwyer only contested two rounds of this year’s 400 Thunder Championship to emerge victorious. “At Nitro Champs in Sydney we made the Quarter Finals and we had a win at Willowbank for the Winternationals. Traveling much further is harder for us these days,” he adds. One of his fiercest competitors in the category is a man who isn’t afraid of hitting the road to secure more track time – Simon Isherwood. “We’ve had a lot of close races over the years; we’re great, competitive friends,” adds O’Dwyer. “We drew Simon in the first round at the Winternationals and he red-lit. Once we got through that first round we knew that we were on our way to the Championship and that it would have taken something serious to bugger up our chances!” exclaims O’Dwyer. “The car was running the best and most consistent it’s ever run,” he adds, and he’s not lying – against the class’s 9.90-second Dial In O’Dwyer ran 9.912 in Round One, 9.905 in Round Two and 9.943 in the Finals. “We were within hundredths of a second each run, I couldn’t have hoped for a better car that weekend,” he says, pride beaming through his voice. O’Dwyer says that he’s not finished racing just yet, and that his iconic HZ still has plenty of life left in it. “I’ll continue racing Super Gas, though I might have to look at another bracket just to keep our track time up,” he explains. “I won’t be changing a thing over the off-season!” he laughs; “I never turn a spanner on it, especially not when it’s running so well, it’s a maintenance-free car,” he says in closing.